The Collage above was created using Painter IX and Photoshop.The photograph is of one of my favorite Kuan Yin statues, I decided to make it the focal point of my digital collage. 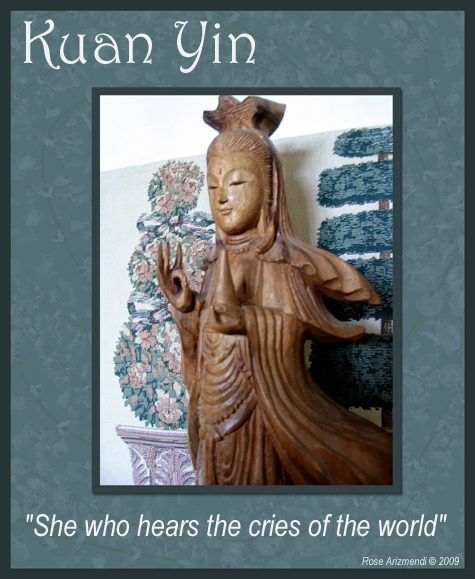 “Many say that Kuan Yin, as the goddess of compassion, evokes the softer side of human nature–the innate softness and unconditional love that counterbalances the drive for competition and dominance.” – Colleen O’Connor. Today I found this wonderful Living Guide tucked away in my file cabinet and wanted to share it with you. Complement three people every day. Never deprive someone of hope. It may be all he has. Never waste an opportunity to tell someone you love him or her. Gemstones for February are Agate, Bloodstone and Onyx. Agates – For centuries agates were known as powerful healing stones. The Native American Indians used them as power stones, and Hindu mystics believed that agates could help children to overcome their fears. 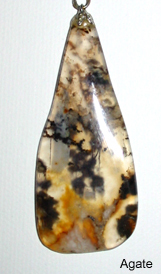 Agates are said to enhance creativity which makes them an excellent stone for artists. Agates promote love, good luck, abundance, longevity, acceptance, courage, protection, balance, harmony, generosity, strength, and security. They also deepen our appreciation and our connection to nature. Bloodstone is an excellent healing stone and helps one with direct union with the creator through contemplation, meditation, and love. 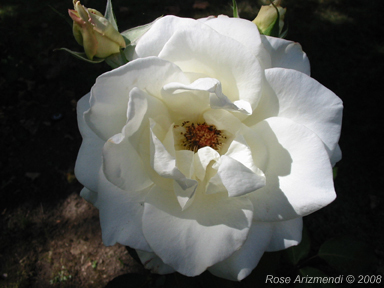 It may also be used to awaken and balance the first four chakras. It is said to promote emotional balance and clarity. 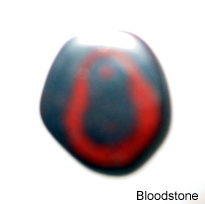 The Bloodstone in the photo above is one of my personal healing stones. I found it years ago and was so excited to have found one with such unusual markings. It is very small which made it difficult to take a good photo. 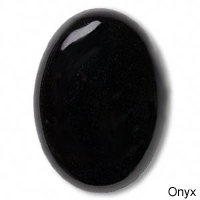 Onyx is a healing stone and a powerful stone of protection. Black onyx governs the root chakra and also helps drain off excessive energies. It is a wonderful grounding stone, valuable in helping us through difficult or confusing times in our lives, and also assists us in releasing past attachments to people, places, and things. It is used in India to ward off the evil eye. All these stones belong to the Chalcedony family. “The path of life may sometimes seem to be rocky and filled with difficulties, things that give trouble. Yet the longer we practice our compassionate heart meditations, the more we begin to understand that those sharp rocks on the road are in fact like precious jewels; they help us to prepare the proper condition for our lives. The rocks are different for each person. One person might desperately need more time alone; another might desperately need more time with other people. The sharp rocks might be working with a nasty person or living with somebody who is hard to get along with. The sharp rocks might be your children, your parents, anyone. Not feeling well could be your sharp rock. Losing your job could be it, or getting a new job and being worried about it. To Practice This Today: Reflect upon an event in your life that at first seemed unpleasant but turned out to be a blessing, and share that story with a loved one. Two polar bears muse on the causes of global warming. Polar Bears – An amazing compilation of beautiful images of Polar Bears. A wonderful message about getting our Spirit/power back through forgiveness.